Qin Dynasty 221 B.C.E.–206 B.C.E. 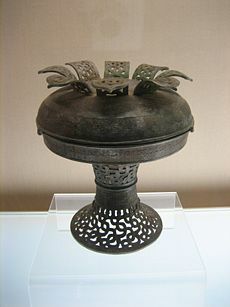 Han Dynasty 206 B.C.E.–220 C.E. Southern & Northern Dynasties 420–589 C.E. Northern Song W. Xia Dyn. The Spring and Autumn Period (春秋時代, Chūnqiū Shídài) was a period in Chinese history, which roughly corresponds to the first half of the Eastern Zhou Dynasty (from the second half of the eighth century to the first half of the fifth century B.C.E.). Its name comes from the Spring and Autumn Annals (Ch'un Ch'iu), a chronicle of the state of Lu between 722 B.C.E. and 481 B.C.E., which tradition associates with Confucius. During the Spring and Autumn Period, the status of the Emperor was diminished to little more than that of a figurehead, while powerful nobles gradually extended their dominions over smaller neighboring states. By the sixth century B.C.E., most small states had disappeared, and a few large and powerful principalities dominated China. Some southern states, such as Chu (楚), and Wu (呉), claimed independence from the Zhou. Wars were undertaken to oppose some of these states (Wu and Yue (越國). In the state of Jin(晋), six powerful families fought for supremacy, and a series of civil wars resulted in the splitting of Jin into three smaller states by the beginning of the fifth century B.C.E.. At that time, the control Zhou kings exerted over feudal princes was greatly reduced, the feudal system crumbled, and the Warring States Period (戰國時代) began. During the Spring and Autumn Period, a complex system of interstate relations developed and many projects requiring the collaboration of two or more states were undertaken, such as drainage operations, canals, dikes, reservoirs, and roads. Massive walls were built, both as protection from each other and from aboriginal and nomadic tribes. Many important cultural developments took place, and great Chinese thinkers including Confucius（孔子), founder of Confucianism; Laozi (老子), founder of Daoism; and Mozi, founder of Mohism developed the philosophical systems which have shaped North Eastern Asia until the present day. King You of Zhou (reigned 781 B.C.E. - 771 B.C.E.) (周幽王, zhōu yōu wáng) was the twelfth sovereign of the Chinese Zhou Dynasty. In 780 B.C.E., after an earthquake hit Guanzhong, a sage named Bo Yangfu (伯陽甫) predicted that the Zhou Dynasty was doomed. In 779 B.C.E., King You of Zhou became enamored of a courtesan named Baosi (褒姒). She had a son by the King, Bofu (伯服), and King You deposed Queen Shen (申后) and Crown Prince Yijiu and made Baosi the new queen and Bofu the new prince. Baosi did not laugh often. In an effort to impress her, King You used the beacon intended to summon the nobles to his aid in case of enemy attack. The nobles rushed to his castle to find that there was no enemy attack and that Baosi was laughing at them for being fooled. When King You saw that Baosi was entertained by this, he used the trick again and again, so that the nobles lost trust in him and began to disregard his lighted beacon. The angry father of the deposed Queen Shen recruited outside forces to come and attack King You. When the attackers approached, King You lighted his beacon, but none of the nobles came to help, thinking that they were being fooled again. King You and Bofu were killed and Baosi was captured. King You’s insincerity had brought about the end of the Western Zhou Dynasty. The fleeing Zhou elite did not have a strong foothold in the eastern territories; even the coronation of the crown prince depended on the support of the eastern states for its success. With the Zhou domain greatly reduced, to Luoyang and nearby areas, the court could no longer support six groups of standing troops (六軍, liù jūn). Subsequent Zhou kings had to request help from neighboring powerful states to defend themselves from raids and to resolve internal power struggles. The Zhou court never regained its original authority; instead, it was relegated to being merely a figurehead of the feudal states. Though the king de jure retained the Mandate of Heaven ( 天命, Tiānmìng), de facto the title held no real power. Urbanization during the Spring and Autumn period. During the Spring and Autumn period, China was ruled by a feudal system. 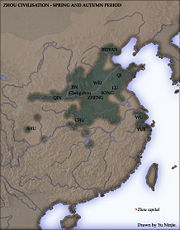 The Zhou dynasty kings held nominal power over a small Royal Domain, centered on their capital (modern Luoyang( 洛陽)), and granted fiefdoms over the rest of China to several hundred hereditary nobles (Zhuhou 诸侯), descendants of members of the Zhou clan, close associates of the founders of the dynasty, or local potentates. The most important feudal princes (known later as the twelve princes, 十二诸侯) met during regular conferences, where important matters, such as military expeditions against foreign groups or offending nobles were decided. During these conferences, one prince was sometimes declared hegemon (伯 and then 霸), and took leadership over the armies of all feudal states. The first noble to assist the Zhou kings was Duke Zhuang of Zheng (郑庄公 or鄭莊公) (r. 743 B.C.E.-701 B.C.E.). He was the first to establish the hegemonial system (bà 霸), which traditional historians justified as a means of protecting weaker civilized states and the Zhou royalty from the intruding "barbarian" tribes, which included the Man in the south, Yi in the north, Rong in the east and Di in the west. As the era unfolded, larger states annexed or claimed suzerainty over smaller ones. By the sixth century B.C.E., most small states had disappeared, and a few large and powerful principalities dominated China. The rulers of the newly powerful states were more anxious to maintain their aristocratic privileges than to follow the tradition, which had been widely propagated during imperial China to consolidate power into the ruling family, of supporting the weak ruling entity during times of unrest (匡扶社稷 kuāng fú shè jì). Dukes Huan of Qi( 齊桓公)(r. 685 B.C.E.-643 B.C.E.) and Wen of Jin (晉文公) (b. 697, r. 636 B.C.E.-628 B.C.E.) took further steps to install a system of overlordship, which brought relative stability, though for shorter time periods than before. Annexations increased, favoring the several most powerful states, including Qin (秦), Jin( 晉), Qi (齊) and Chu. The role of the overlord gradually changed from the protection of weaker states to a system of hegemony of major states over weaker satellites of Chinese and "barbarian" origin. On the pretext of offering aid and protection, the overlords of the larger states intervened in the internal conflicts of the smaller states and gained advantages over them. The overlords proclaimed themselves masters over their territories, with little recognition of the figurehead, King of Zhou, whose duties were mostly priestly, ritualistic and diplomatic. The establishment of a local administration system (Jun and Xian), with officials appointed by the government, gave states better control over their dominions. Taxation facilitated commerce and agriculture more than proto-feudalism had done. Some southern states, such as Chu (楚), and Wu (呉), claimed independence from the Zhou. Wars were undertaken to oppose some of these states (Wu and Yue (越國)). The three states of Qin (秦), Jin( 晉) and Qi (齊) not only optimized their own strength, but also repelled the southern state of Chu (楚), whose rulers had proclaimed themselves kings. The Chu armies gradually intruded into the Yellow River Basin. The northern states referred to the Chu as the "southern barbarians," (Chu Man). Chu intrusion was checked several times in three major battles of increasing violence with the Jin armies: the Battle of Chengpu(城濮之戰) in 632 B.C.E., the Battle of Bi ((邲之戰) in 595 B.C.E., and the Battle of Yanling (鄢陵之戰) in 575 B.C.E. between the armies of Chu and Jin at Yanling. These victories resulted in the restorations of the states of Chen (陳) and Cai( 蔡). Many important cultural developments took place in China during the Spring and Autumn Period. Merchants and artisans began to take on importance. Great Chinese thinkers including Confucius（孔子), founder of Confucianism; Laozi（老子）or Lao tse, founder of Daoism; and Mozi, known as Motse (墨子 Mò Zǐ), founder of Mohism developed the philosophical systems which have shaped Asia until the present day. The system of Confucian government administration, with a bureaucracy staffed by qualified scholars who had to undergo a civil service examination, was established. A complex system of interstate relations developed during the Spring and Autumn Period. It was partially structured upon the Western Zhou (周朝) system of feudalism, but operated according to a code of customary norms and values, which loosely resembled international law. As the states attempted to expand and assert themselves, diplomatic encounters among them increased. Many projects requiring the collaboration of two or more states were undertaken, such as drainage operations, canals, dikes, reservoirs, and roads. Massive walls were built, both as protection from each other and from aboriginal and nomadic tribes. Long walls too were thrown up as a means of protection not only against one another but also against aboriginal and nomadic tribes. After a period of increasingly exhaustive warfare, Qi, Qin, Jin, and Chu met for a disarmament conference in 579 B.C.E., and in 546 B.C.E., Jin and Chu agreed to yet another truce. During the relatively peaceful sixth century B.C.E., the two coastal states in today's Zhejiang( 浙江), Wu( 呉) and Yue( 越國), gradually grew in power. After defeating and banishing King Fu Chai of Wu (吳王夫差), King Gou Jian of Yue( 越王句踐) (r. 496 B.C.E.-465 B.C.E.) became the last recognized overlord. This era of peace was a prelude to the maelstrom of the Warring States Period ( 戰國時代) which followed. The four powerful states were all embroiled in internal power struggles. In Jin (晋), six elite landholding families waged war on each other. The Chen family was eliminating political enemies in Qi. Legitimacy of the rulers was often challenged in civil wars by various royal family members in Qin and Chu. Eventually each of these conflicting groups established its own dominion. The Warring States Period officially started in 403 B.C.E. when the three remaining elite families in Jin , Zhao, Wei and Han, partitioned the state and the impotent Zhou court was forced to recognize their authority. The control exerted by Zhou kings over feudal princes was greatly reduced, the feudal system crumbled, and the Warring States Period( 戰國時代) began. The name following the name of the state is the capital (En., TC. and SC.). Guan Zhong (管仲), statesman and advisor of Duke Huan of Qi and regarded by some modern scholars as the first Legalist. Baili Xi (百里奚), famous prime minister of Qin. Bo Pi, （伯噽）the corrupted bureaucrat under King He Lu and played important diplomatic role of Wu-Yue relations. Wen Zhong文種 and Fan Li范蠡, the two advisors and partisans of King Gou Jian of his rally against Wu. 770 B.C.E. - the nobilities of the Zhou realm supported King Píng of Zhou (周平王) as the new king of the Zhou Dynasty. King Píng moved the capital to luò yì (雒邑). The era of Eastern Zhou, or Spring Autumn, began. King Píng appointed the son of the nobility Yíng Qí (贏其) to the northwestern part of the Zhou realm. He was named Duke Xiāng of Qin (秦襄公). The kingdom of Qin (秦) was born. 763 B.C.E. - Duke Zhuang of Zheng (郑庄公) attacked and destroyed the barbarian kingdom of hú (胡國). Duke Zhuang relied on his famous officer Zhài Zhòng (祭仲). 704 B.C.E. - Duke of Chǔ (楚), Mǐ Xióng Tōng (羋熊通), saw the weakened power of the King of Zhou as an opportunity to break free from being a tributary state of the Zhou Dynasty and claimed the title of king himself. He announced the kingdom of Chǔ (楚國) and called himself King Wu of Chu (楚武王). 701 B.C.E. - Duke Zhuang of Zheng (鄭莊公) died. His son Jī Hū (姬忽) succeeded the title of Duke and was known as Duke Zhāo of Zheng (鄭昭公). Because Lady Yōng (雍氏) of Song (宋國) was married to Duke Zhuang of Zheng and had a son named Ji Tū (姬突), the King of Song thought that he could extend influence in Zheng by helping to support a new ruler who had relations with Song. Zhài Zhòng (祭仲), who had the respect and influence in the state of Zheng, was lured and captured by Song and was forced to support Jī Tū as the successor to the throne. A Visual Sourcebook of Chinese Civilization. Spring and Autumn Period Travel China Guide. History of "Spring and Autumn Period"
This page was last modified on 19 October 2015, at 20:16.